We’ve all forgotten something at one time or another. Where did I put my keys? What did I need to get at the store? Did I remember to lock the door? Why did I come into this room? For most of us, the fast pace of life and how quick thoughts might go in and out of our heads is the likely culprit. If we slow down and try to remember the last time we had our keys, or retrace our steps from the room back to where we were, we can usually jog our memory (most of the time). As we age, we find that some of these moments happen with a little more frequency. But what happens when it’s not just a routine bout of forgetfulness? And how can you tell if it’s something more serious? Many of us probably know someone who has/had Alzheimer’s disease or who has been a caregiver for someone with Alzheimer’s disease. We’ve all heard the term. Most of us know that it is generally an older person who has trouble with short-term memory loss. But what really is Alzheimer’s? Is it the same as dementia? Dementia is a general term for a decline in mental ability severe enough to interfere with daily life. It is an overall term that describes a wide range of symptoms associated with a decline in memory or other thinking skills severe enough to reduce a person’s ability to perform everyday activities. Memory loss is one symptom of dementia. There are several different types of dementia. Each can be caused by different factors, such as stroke or thyroid issues. So, it is important to visit an expert to be sure you’re following the best treatment pathway. The most common type of dementia is Alzheimer’s disease, accounting for 60-80% of all dementia cases. However, the following conditions can also cause dementia: Parkinson’s disease, Creutzfeldt-Jakob disease, Huntington’s disease and Wernicke-Korsakoff Syndrome. Vascular dementia can also be brought on after suffering a stroke. Alzheimer’s disease is a slow, progressive brain disease that currently has no cure. It can be treated with medications which may temporarily slow the worsening of symptoms for some. The most common and obvious symptoms of Alzheimer’s is difficulty remembering newly learned information, such as recent conversations, names or events; apathy and depression are also often early symptoms. Later symptoms include impaired communication, poor judgment, disorientation, confusion, behavior changes and difficulty speaking, swallowing and walking. For many loved ones, the behavior caused by Alzheimer’s is the most challenging and distressing effect of the disease. Persons with Alzheimer’s have been known to ‘wander’ out of the house at all times of the day or night. They become confused or agitated easily and are more prone to outbursts. They may experience restlessness, and you might find that their behavior becomes more repetitive, with them pacing and/or shredding paper or napkins with their hands. The chief cause of these behavioral symptoms is the progressive deterioration of brain cells. Alzheimer’s symptoms are separated into stages; early-stage, middle-stage and late-stage. The duration of each stage is different for each individual and can last for years. Read about each Stage here. Many times, some of the early-stage symptoms go unnoticed, because the individual is still able to function independently. Few difficulties and behaviors may be noticed by some who close to the person, but might be shrugged off as part of normal aging. The middle-stage is typically the longest stage and can last for many years. A person with middle-stage Alzheimer’s may begin confusing words and become frustrated, even combatant, and acting in unexpected or inappropriate ways. In late-stage Alzheimer’s, individuals lose the ability to respond to their environment, to carry on a conversation and, eventually, to control movement. They may need extensive help with daily activities, and have trouble communicating needs or pain. Often, the responsibilities and decision-making are placed on the closest loved ones. A spouse, who may be dealing with his or her own aging difficulties, and adult children of Alzheimer’s patients are often left to deal with a lot of information, appointments, stress, healthcare decisions and more. Caregivers may feel like they are alone. They may feel guilty for a variety of reasons including asking for help, needing a break, losing their temper or not being able to ‘do it all’. No one can do it all alone. Caregivers need a strong support system. Caregivers have access to respite care, in-home care, adult day centers and more. There are also support groups for caregivers to get together with people who are in the same situation. One way for caregivers to ensure that they know the wishes of their loved ones is to talk about and complete advance directives before they are thrust into a situation where the person is no longer able to make decisions for themselves. Whether it’s Alzheimer’s, another form of dementia, or any other condition that could potentially leave a person unable to express his/her wishes, having an advance directive, which includes a living will and durable power of attorney (POA) for healthcare is an important part of your medical file. Without these documents, a loved one will not know what types of treatment or interventions you want. And if you are unmarried, no one is legally able to make those decisions if you have not declared a healthcare POA ahead of time. If you suspect a loved one has Alzheimer’s disease or another form of dementia, your first step should be to visit his/her family doctor. He or she can direct you to a specialist who will look at the person’s full medical history, conduct tests and determine the best treatment options for your loved one. Complete this checklist and bring it with you to the doctor’s visit. For additional information and caregiver support information, visit the Alzheimer’s Association website at www.alz.org. Two separate recent studies suggest that being married may improve the likelihood of surviving a heart attack and may also help you beat cancer. It is possible that the reason for this is that married folks have a significant other nagging … er, I mean strongly encouraging … them to go to the doctor on a regular basis and get a checkup. 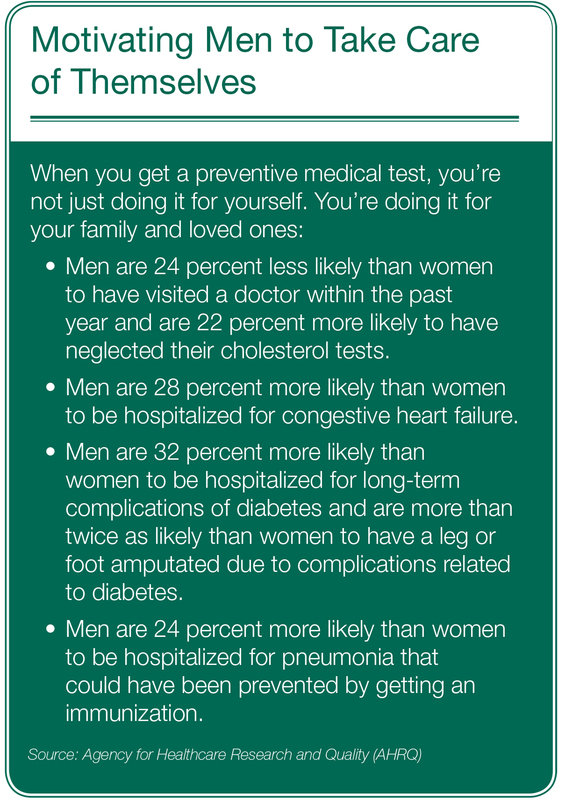 Preventive care and early detection are key to maintaining and continuing a healthy lifestyle as you age. Finding cancers early, learning about diseases or conditions at an early stage, gives you a better chance of doing something about it. The best way to proactively keep yourself healthy is to take care of your body. So whether you have a spouse to ‘encourage’ you or not, there are some steps you can take to get in shape and keep healthy. Walking briskly, mowing the lawn, playing team sports, and biking are just a few examples of how you can get moving. If you are not already physically active, start small and work up to 30 minutes a day of moderate physical activity for most days of the week. Fruits, vegetables, whole grains, and fat-free or low-fat dairy products are healthy choices. Lean meats, poultry, fish, beans, eggs, and nuts are good, too. Try to eat foods that are low in saturated fats, trans fats, cholesterol, salt and added sugars. Try to balance the calories you take in with the calories you burn with your physical activities. As you age, eat fewer calories and increase your physical activity. This will prevent gradual weight gain over time. Drink alcohol in moderation or not at all. For more information on quitting, visit Quit Smoking section. Take aspirin to avoid a heart attack. If you are at risk for a heart attack (you’re over 45, smoke, or have diabetes, high blood pressure, high cholesterol, or a family history of heart disease), check with your doctor and find out if taking aspirin is the right choice for you. May is Older Americans Month. People in the U.S. are living longer than ever before. Many older adults live active and healthy lives. But there’s no getting around one thing: as we age, our bodies and minds change. Though there are things you can do to stay healthy and active as you age, it is important to understand what to expect. Some changes may just be part of normal aging, while others may be a warning sign of a medical problem. It is important to know the difference, and to let your healthcare provider know if you have any concerns. Include physical activity in your daily routine. Try walking, swimming or other activities you enjoy. Regular moderate physical activity can help you maintain a healthy weight, lower blood pressure and lessen the extent of arterial stiffening. Eat a healthy diet. Choose vegetables, fruits, whole grains, high-fiber foods and lean sources of protein, such as fish. Limit foods high in saturated fat and sodium. A healthy diet can help you keep your heart and arteries healthy. Don’t smoke. Smoking contributes to the hardening of your arteries and increases your blood pressure and heart rate. If you smoke or use other tobacco products, ask your doctor to help you quit. Manage stress. Stress can take a toll on your heart. Take steps to reduce stress — or learn to deal with stress in healthy ways. Get enough sleep. Quality sleep plays an important role in healing and repair of your heart and blood vessels. People’s needs vary, but generally aim for 7 to 8 hours a night. Stay mentally active. Mentally stimulating activities help keep your brain in shape—and might keep memory loss at bay. Do crossword puzzles. Take alternate routes when driving. Learn to play a musical instrument. Be social. Social interaction helps ward off depression and stress, which can contribute to memory loss. Look for opportunities to get together with loved ones, friends and others. Lower your blood pressure. Reducing high blood pressure might reduce vascular disease that might in turn reduce the risk for dementia. More research is needed to determine whether treating high blood pressure reduces the risk of dementia. Include physical activity in your daily routine and eat a healthy diet. If you’re concerned about memory loss, consult your doctor. May is American Stroke Awareness Month. It is very important for you to know that anyone can have a stroke. Strokes can affect people of all ages and backgrounds. Every 40 seconds, someone in the U.S. has a stroke. In 2008 alone, more than 133,000 Americans—or one person every four minutes—died from stroke, making it the fourth leading cause of death in the U.S. There are many risk factors for stroke. Some risk factors, such as gender, ethnicity and age, are uncontrollable. But there are some risk factors that you can control. Taking control is the first step to managing your risk. Get moving. If you are healthy, participate in moderate to vigorous-intensity aerobic exercise at least 40 minutes per day, three to four times per week. Watch your diet. Consider reducing sodium intake to <2300 mg/day and consider diets rich in fruits and vegetables such as the Dietary Approaches to Stop Hypertension (DASH) or Mediterranean diets. Know your numbers. Keep your blood pressure, cholesterol and sugar levels in check. Know your family medical history. If high blood pressure and diabetes are common conditions, it’s important you ask your doctor what you can do to prevent them. Drink moderately. Studies show a strong connection between alcohol and stroke so make sure to moderate your alcohol intake. No more than two drinks per day for men and one for women. Stop Smoking. Smoking decreases your health in general, but smokers also have 2-4 times the risk for stroke compared to nonsmokers and those who have quit for more than 10 years. Most people don’t know the warning signs of stroke or what to do when one happens. Stroke is an emergency. But acting quickly can tremendously reduce the impact of stroke. A stroke is a brain attack that occurs when a blood clot blocks an artery or a blood vessel breaks, interrupting blood flow to an area of the brain. Brain cells begin to die. Does one side of the face droop or is it numb? Ask the person to smile. Is the person’s smile uneven? Is speech slurred? Is the person unable to speak or hard to understand? Ask the person to repeat a simple sentence, like “The sky is blue.” Is the sentence repeated correctly? If someone shows any of these symptoms, even if the symptoms go away, call 9-1-1 and get the person to the hospital immediately. Check the time so you’ll know when the first symptoms appeared. A nice, brisk walk can lower your risk of high blood pressure, high cholesterol and diabetes as much as running, according to a new study conducted at Lawrence Berkeley National Laboratory, Life Science Division in Berkley, Calif. All three conditions are risk factors for heart disease and stroke — and you can do something about them. Researchers analyzed 33,060 runners in the National Runners’ Health Study and 15,045 walkers in the National Walkers’ Health Study. They found that the same energy used for moderate- intensity walking and vigorous-intensity running resulted in similar reductions in risk for high blood pressure, high cholesterol, diabetes, and possibly coronary heart disease over the study’s six years. Read more about the study highlights. The more people walked or ran each week, the more their health benefits increased. The findings are consistent with the American Heart Association’s recommendations that adults should get 30 minutes of physical activity per day, at least 150 minutes of moderate activity per week or 75 minutes of vigorous activity per week to derive benefits. You don’t have to set a marathon pace or walk for miles. You can start slow and start small. Maybe you start by walking around the block twice each night. You can work toward your overall goal of 30 minutes a day by increasing your time as you get in better shape. And if you’re busy—like most of us—you can split up your walks into 10-15 minutes each. Have a dog? He’d be more than happy to join you for a walk. So maybe you take Fido on a 15-minute walk in the morning and one in the evening. (You could probably ‘try’ this with a cat too … though I wouldn’t recommend it.) You could also tap a friend of the human persuasion who can be your walking buddy. Pretty soon, you’ll be talking and walking and not even realize you’ve been ‘exercising’ for 30 minutes. Too hot or too cold outside? Bad weather? Go to the mall. Take a couple of laps around each level of the mall. Then maybe afterwards you can treat yourself to that new pair of shoes you’ve been eyeing! All you have to do is lace up with a good pair of sneakers—and walk. It’s that easy. It’s also safe. And it’s the least expensive form of exercise (new shoes purchase notwithstanding); and it has the lowest dropout rate of any type of exercise. Before you know it, brisk walking can become a part of your daily routine. And you’ll reap plenty of benefits.